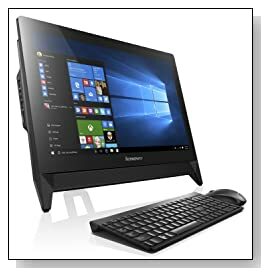 Lenovo C20 F0B3005BUS is the recent release budget 19.5 inch All in One- AIO desktop with a stylish and sleek design, entry level but current specs for home entertainment or basic work and student use at a very reasonable price. Everything is inside the screen and keyboard and mouse combo are also included in the package so they had to cut down on costs by using the Carrizo-L quad core AMD E1-7010 processor (1MB Level 2 cache) at fixed 1.5GHz speed without turbo or hyperthreading as it already has four cores, 4GB DDR3L SDRAM at 1333MHz and 500GB Serial ATA hard drive which would be the minimum for laptops and desktops these days and Windows 10 operating system. SATA hard drive is the 7200rpm speed variety vs 5400rpm that you'll find on budget machines and you have the Full HD resolution display of 1920 x 1080 pixels as well as a decent keyboard and mouse. Black Lenovo C20 has a slim and stylish design, weighs 8.4 pounds and measures 19.17 x 14.38 x 1.95 inches and as everything is inside the screen it won't take up much space. The AMD E1-7010 performs better than the older processor 6010 so the benchmark score should be roughly 900 although it is not published on the Passmark benchmark website yet. But it is also only good for simple daily tasks like typing documents on Word, spreadsheets on Excel, browsing the internet and watching videos and light gaming as you can't expect too much from the integrated entry level Radeon R2 graphics card which is slower than the Intel HD 4000 so it will let you play older titles like Minecraft or World of Warcraft or browser based games as this AIO Lenovo is way cheaper than a powerful gaming machine. You have the 3 watt stereo speakers for reasonably good sound for your movies, games and music and a 720p resolution webcam for your informal live chats with family and friends. There is the DVD+/-RW Optical Drive for DVDs and CDs, 802.11bgn wireless, Bluetooth 4.0, Gigabit Ethernet with RJ-45 connector, 2 x USB 3.0 ports and 2 x USB 2.0 ports for your peripherals, and HDMI output to connect other displays and Media Card Reader. The best thing about this machine is the low price as it is probably the cheapest modern All-in-One desktop we have come across so far. 19.5 inch screen is not touch enabled but is good size for having two Word documents side by side. 4GB memory is mostly adequate for computer users that are purchasing such machine but if you think you need more memory for smoother multitasking you may upgrade it to 8GB as long as you know a bit about computer hardware. 500GB doesn't look like a lot of storage space but you can certainly fit quite a lot in it and 7200rpm speed is good at this low price point but is nowhere as fast as an SSD which has also been getting cheaper so you can replace the SATA HDD with an SSD (no bays for additional drives) and you have to do with the low end Radeon R2 GPU as you can't put a dedicated card on this one. Thermal Design Power is only 10 watts for the whole system and this will save you on energy usage. 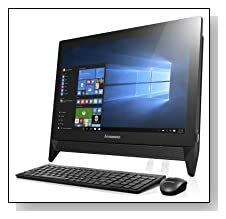 As long as you don't plan to run multimedia editing software or play current games and you will use the computer for editing Word documents, doing your spreadsheets, surfing the net or video playback, then the budget priced Lenovo C20 is worth considering.